Ferriers Barn is an Art & Craft Centre for severely disabled people. 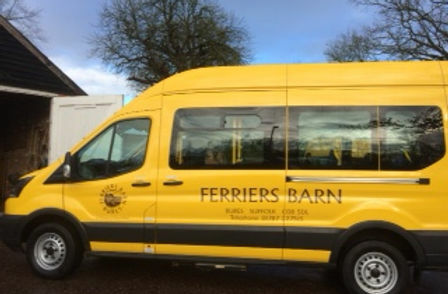 Ferriers Barn is located on the outskirts of Bures and has been running since 1974 as a day centre for people with disabilities. The Barn has developed as an arts and crafts centre where the Members (that is, those who attend) are taught and their families and carers are provided with essential respite. Activities undertaken there include woodworking, painting, gardening, mosaics and more general arts and crafts. Equally important to the Members is the relaxed and friendly environment the Barn offers, so allowing them to develop their skills in a supportive and sociable atmosphere. A freshly cooked, two course hot meal is provided every day. In July 2016 Ferriers Barn was pleased to reveal the new accessible garden, with raised beds, allowing wheelchair users full access. The garden is full of sensory plants and flowers which the members chose and planted themselves. During the spring we will be working on the new and existing garden, planting new bulbs, clearing new spaces and getting ready for a summer in full bloom. Not only does The Barn help develop these skills in the members, more importantly it provides them with the opportunity to meet others, to have a chat over a cup of coffee and, just as importantly, allows the members’ families and carers to have a little time to themselves during the day. Qualified instructors run the sessions (which last from around 10:00 a.m. to 3:00 p.m. during term times) but both they and the members also rely on volunteers to help run the sessions. Volunteers do not need to be skilled in woodwork, drawing and arts and crafts to provide valuable help in delivering these sessions. Much more important is an interest in others, the ability to chat and swap a few stories, and to create an environment where the members can work and also enjoy themselves.